Understand me, I'm not saying that adding the forested hill hexes in Piedmont is the ultimate evil. I'm only saying that, if we're to respect strictly (and that could not necessarily what we want to do) the canonic informations extrapolated from maps and/or modules, we should accept that in this single case the map's implication is that those Nicostenian woods should cover less than half each 8-m hex on the GAZ2 map. Obviously, as Thorf said above, there are a lot of cases in which maps don't match the descriptions given in the GAZs - Karameikos' hills being the most evident example. In that case, an update of the map is mandatory; but in Piedmont's one, is it really? Or can we just explain Ylaruam's source of lumber as many small separated patches of woods, each of whom isn't large enough to fill an 8-m hex? How would it look if we had 4 or 5 forested hill hexes interspersed with the normal hill hex. That would still give the visual cue that there are trees here, but may also imply that they are sparsely populated? I'm trying to think "what would I do if I were going to take that area and create a 1mi/hex map?" If I saw all those forested hills hexes together I would probably just create one big lump of forested hexes. However if I saw forested hills hexes interspersed with normal hills I might start to think, "Hey, why did they do that? This must not be a single large area covered by forested hills." Love the map - much better than the original! I just posted the finished updated map over at the Atlas of Mystara. Thanks to everyone who contributed to this thread! The map is far better for it. First, I must thank Thorfinn for his generosity, the biggest work of mapping Mystara and ... for giving me this chance to modify it. - other colours = no human population (but … what about monsters?? ). 6) I placed Kirkuk in Makistan Emirate, instead in Dithestenia (*). - another good placement could be in Nicostenia (the 2nd hex, south/west Cubis) but, again, Cubis seems far from the " Barimoor's underground Complex". - oasi (settled): 10-20 people/sqm. We know an 8 miles hex has 55,426 square miles (sqm). Knowing this, for each Emirate, we can calculate how many people lives in each settled/borderland/wilderness hex. Note 1: vassals must have enough population to substain their expenses. Last edited by fabriziohockey on Thu Mar 07, 2019 4:58 pm, edited 38 times in total. Great Information...very useful when I finish Ethengar 1 mile hex map and begin with Ylaruam 1 mile hex map (and Nithia era based on my earlier Nithia 8 mile hex map, and Morgreth era to locate all the former ruins, settlements, features). I described wilderlands regions with the possible population of non-human intelligent creatures. In general I prefer a rather high density of intelligent creatures. I saw this map very few time ago, on Pandius, while I was looking for a suitable map for my demographic representation. The demographic informations on which I rely are essentially those of Gazetteer 2, with something from PWA1 and TM2. Last edited by fabriziohockey on Thu Jan 10, 2019 10:29 am, edited 1 time in total. At the beginning, even I placed some people along the trade road between Chtesiphon and Tameronikas (surely there is someone, but with a really hard life). I think Ylaruam is really interesting for this reason: is the Kingdom with lesser food and water capacity in the Known World. You are right, but seems we are going away. In my campaign I thought to give a bonus to the Emirate's food production, due to the clerical power to create food and water. As ex. Abbashan: there, the "clerical power" generates about 10% food (obviously I'm using an Excel file to calculate all). Another DM could think: "let's calculate how many clerics there are in a Kingdom, with enough power to substain its population!". I remember there are such rules in D&D 3.0 (DM Book) but, again, we need the "Excel power"
And, obviously, another DM could easily say to his players: "don't worry for your 500.000 people in your new wonderful city in the desert! you have clerics!". Last edited by fabriziohockey on Fri Jan 11, 2019 4:59 pm, edited 2 times in total. I'd like such calculations, want to share them? I changed something on the coast, reducing the civilization levels. This was necessary due to the demographic levels indicated for the settled coastal plains (40-70 people/sqm). - desert (Wilderness): 55 hexes, 2.750 pop. (0,90/sqm). - desert (wilderness): 8 hexes, 400 pop. (0,90/sqm). - desert (wilderness): 14 hexes,	700 pop. (0,90/sqm). - desert (wilderness): 15 hexes,	750 pop. (0,90/sqm). - upland (wilderness): 5 hexes, 250 pop. (0,90/sqm). - desert (wilderness): 7 hexes, 350 pop. (0,90/sqm). - desert (wilderness): 14 hexes, 700 pop. (0,90/sqm). - desert (wilderness):	16 hexes, 800 pop. (0,90/sqm). 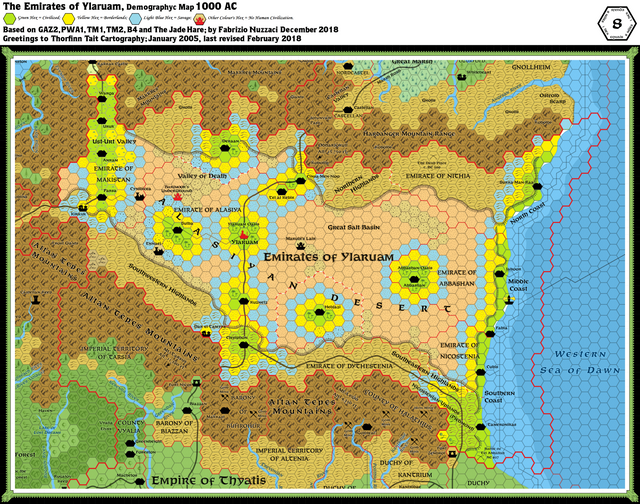 - coastal plain (wilderness): 2 hexes, 100 pop. (0.90/sqm). - oasi (settled): 1 hex. 600 pop. (10,83/sqm). - desert (wilderness):	2 hexes, 90 pop. (0,81/sqm). (*) PWA1 and TM2 indicate the Emirates population in 230.000 people; Gaz. 2 indicates in 229.700 people. I considered the 300 more as Dar El Tamiyya inhabitants. GMs that want a larger civilization area, could reduce the density of wild hexes to 0.45/sqm (you will have twice the wilderness hexes); as ex. you may want to assign 0.45 to the wilderness hexes of Dithestenia, in order to distribute some of the population on the trade route hexes (which are now without population). However, in this way there would be areas with a stable presence (nomads) even 24 miles away in the desert (too much? ), as well as involving "very hot points" such as the Barimoor's underground complex. Anyway, it's a GMs choice. PS 1: I apologize for the many changes in my first post. PS 2: I would like share calculations on the support of the population when ready (I'm still working on it) and in antoher topic. But we can agree this: referring to the rules, an "8" HD cleric can create food for 12 people each day (+12 for each level more). We could also assume at least 2% are clerics (= 152). Surely, most of these 152 are low levels; only a few of them will have 8HD or more. We can calculate Dythestenia has 31 "deputy chaplain" (1/250 inhabitants as described in CM2) and at least 1 chaplain. We can immagine deputy chaplain are low level clerics; just the chaplain could create food. So, let's think 1 cleric out of 30 has 8 HD or more: with a 2% rate, Dythestenia will have 5 of such clerics. This means the clerical power in Dythestenia can create food for only 60 people each day … unfortunately, too few. Otherwise, we can think to the Elven Kingdoms, where all the inhabitants are elves. Last edited by fabriziohockey on Sun Mar 24, 2019 5:36 am, edited 2 times in total. Personally I would assume a much higher population in Ylaruam, but the calculation still stand about high level clerics, so probably not enough to feed the whole population. Still it improves things, and what could have been in a non clerical nation a devastating famine with thousands of deaths could become a much less devastating famine. About elves, I'm inclined to think to them as an ancient civilization who probably has developed complex and efficent methods of food production in the forest, and probably hunting is just a minor source of food, carried out more to check excessive populations than as a primary need.